By Peggy Schulz. Photo by Becky Vinz We’ve heard a lot about DIY – Do It Yourself. Nicole Jain Capizzi is a staunch proponent of GIY – Grow It Yourself. Nicole and her husband Kyle have lived in Riverwest since August 2006. Nicole currently has two jobs, both involving organic farming, and one business, Honey Hill Gardens which offers CSA (Community Supported Agriculture) shares of local produce. The story of how Nicole got to this point in her career is as interesting and varied as the work she does. As a young girl growing up in Tacoma, Washington, she watched her mother garden and create pottery for use in their home. “Seeing my mom do that, make things for our family,” was the start, Nicole says. While in college, earning a degree in English, Nicole began working at plant nurseries. “I was just blown away by the idea that you could grow your own food,” Nicole says. Nicole then served as an Americorps volunteer for a year, as the School Garden Manager at Orca School Garden in Seattle. Then, a six-month intensive apprenticeship at the Center for Agroecology and Sustainable Food Systems, based at the University of California-Santa Cruz, propelled her further into the field of organic farming, both literally and figuratively. “I knew I wanted my life work to be outside, involving science in some way, and producing something,” Nicole says. Because she grew up in Tacoma and then lived in Seattle, she always could see herself living in a city. But she also wanted to be a farmer. “But that’s kind of a challenge,” she says, to do both, with not the least bit of uncertainty in her voice. Finally, when Nicole was in her 20s, her sister got cancer and dramatically changed her lifestyle, including a major overhaul of her diet. “That was the topper for me,” Nicole says, to see how her sister overcame cancer, partly by eating much more healthfully than she had before that point. “I realized then I needed to find work that not only was enjoyable for me,” she says, “but also in which I could be part of our nation’s health, to have good food available locally.” Nicole first came to the Midwest in 2004, to begin working at Prairie Crossing Institute, in Grayslake, Illinois. She developed a farm-based curriculum and educational farming systems for Prairie Crossing. Nicole spent many, many hours developing and maintaining the programs at Prairie Crossing, including teaching, managing and developing the organization as a whole. Then, two years ago, she decided she wanted to establish her own farm, a truly urban farm, in the Milwaukee area. “I needed to start a project of my own, closer to home,” Nicole says. She attended a conference last spring in urban agriculture. She starting asking around, and finally heard back from Dennis Lukaszewski, Urban Gardens Coordinator for Milwaukee County UW Extension. Nicole’s resulting quarter-acre farm, Honey Hill Gardens, is located within the Extension’s Firefly Ridge Community Garden in Wauwatosa, just east if I-45. It’s one of several community gardens sponsored by the Extension in the county. 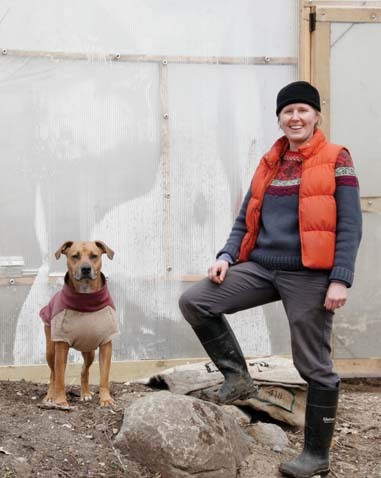 “I thought it might be a great way to show a farm could work on this scale,” Nicole says, “plus it offers the opportunity for education.” Nicole currently is also an Urban Agriculture Educator for Milwaukee County UW Extension. While the farm at Prairie Crossing is certified organic (through the Midwest Organic Services Association), Nicole has not sought the same certification for Honey Hill Gardens. “There’s the Big O,” Nicole says, “and the small o.” The first is certified organic and the latter is, indeed, organic, but the focus is on making the farm sensible and sustainable, she says. In Nicole’s opinion, it’s all about taking the long view of the farm as a whole, as opposed to making a knee-jerk reaction to a temporary, instant problem. For example, if a particular species of beetle appears in her soil, she doesn’t immediately seek to eradicate the beetle, especially not with noxious chemicals. Any insects or animals farther up the food chain that might eat such a poisoned beetle would carry those toxins with them. Far better to use the least toxic yet most efficient method available, she says. Simple soap water often is an effective deterrent and does no harm to the plants, the soil or the pest’s natural predators. “I work to build plant and soil health by working with natural systems as a whole,” Nicole says. It’s all about the microorganisms in the soil. And achieving the right balance of naturally-occurring organisms doesn’t happen quickly. Nicole herself exudes a sense of balance, whether she’s talking about chemical residues left behind in the soil on urban lots, or the different challenges in teaching microfarming to adults as compared to the young students at Prairie Crossing. It’s a balance arrived at over years of education, training and personal experience. And to think it all started with the observation: “Hey! I can grow my own food!” CSA shares for the main part of the season at Honey Hill Gardens are sold out, but a few remain for fall greens and for flowers, which Nicole likes to call “soul food.” For more information on Honey Hill Gardens visit honeyhillgardens.com.